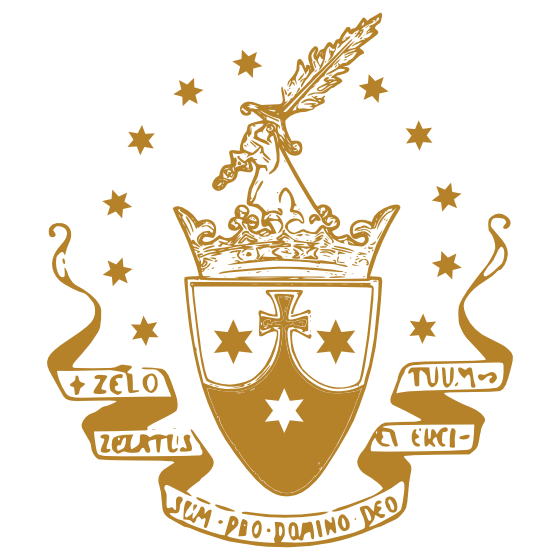 Prayer is the heart of Carmelite life, and the chapel is the heart of a Carmelite monastery. The nuns adore Jesus present in the Holy Eucharist as the summit and source of our entire consecrated life during the two hours of mental prayer, the Divine Office, Rosary and other exercises of piety each day. In Carmel, the sacred liturgy is characterized by simplicity to allow more time for private prayer in accord with our hermit spirit. The Divine Office is usually recited on one tone, with Gregorian chant reserved for Sundays and feast days. After our foundress Mother Teresa Margaret died, one of her cherished wishes began to be fulfilled: the restoration of Latin as our primary liturgical language. We discovered that after the vernacular languages had been approved for the liturgy, Pope Saint Paul VI had written to the monastic communities begging them not to give up Latin in the Divine Office. We began praying that Our Lord would make His will clear to us and remove any obstacles, and soon other monasteries supplied us with liturgical books, and a retired professor volunteered to teach us Latin at various proficiency levels! As our knowledge of Latin increases, we find “our hearts burning within us” as the depths of Scripture and liturgical texts open up to us. Why Latin? By our fidelity to the mind of the Church during past years of liturgical upheaval, our monastery became known as an oasis of reverent liturgy, Gregorian chant, and other welcome devotions like Benediction of the Blessed Sacrament and May processions, and has become a seedbed of priestly and religious vocations. Today Holy Mass is celebrated in the Extraordinary Form of the Roman Rite as the norm. The Divine Office is prayed in Latin according to the ancient Monastic Breviary, the text closest to that prayed by our Carmelite Saints for centuries. We are steadily adding more Latin chant to the celebration of Mass and the Office, and we welcome new members who share our love for our Catholic liturgical heritage. and for those who visit our monastery, we give some history here. Our first chapel on Peninsula Drive, nestled in the bay window of a former “breakfast nook” in the remodeled house, had a simple wooden tabernacle and altar, and a choir so tiny that some nuns had to kneel in the adjacent hallway. In 1959 we broke ground on our permanent monastery. 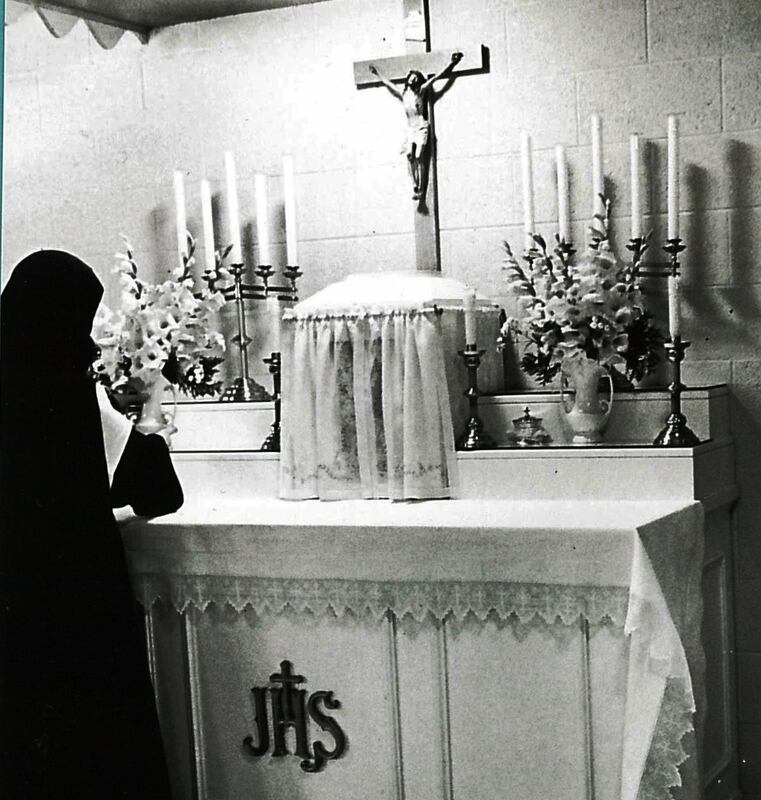 Mass was celebrated in the basement using the original wooden altar, until we had enough funds to complete the chapel in 1962. The Catholic Extension Society donated a new altar made of Spanish marble. Several years later, following the liturgical norms of the time, we moved the marble altar to allow the priest to offer the Holy Sacrifice facing the people, and acquired a low trapezoidal tabernacle—a briefly-popular design that the future Pope Benedict XVI was later to commend in his writings on the liturgy. In God’s Providence, the Eucharistic Jesus remained at the very center of our chapel for the next forty years, when in so many churches the tabernacle was moved to the side or out of sight. In 2009 we replaced fiberglass windows with stained glass designed by Father Richard Cannuli, whose combination of traditional and abstract styles seemed the best fit for our “modern” chapel. .Little did we dream that within a year another priest friend would introduce us to a talented architect who would free our sanctuary of its dated look altogether. Duncan G. Stroik, professor of architecture at Notre Dame University and the leader of a growing movement to return classical ideas of beauty and harmony to sacred architecture transformed our sanctuary to give it a timeless beauty. Our cloistered chapel presented him with a unique challenge: to make it visually beautiful both from the nuns’ side, and for the congregation. We also wanted to implement the liturgical reform of Pope Benedict, and so the altar had to be freestanding to allow Mass to be celebrated from either side. With permission from Rome, we have a single grille in the choir to allow the nuns to see the Mass better, although our visitors’ parlor has the traditional double grille.